I was accepted to be a Research Field Assistant for the Sea Turtle Conservation program in late August 2015. Within two weeks, I was already off to Costa Rica. Because everything happened so quickly, I was nervous about what my job would be like and how I would adjust to living in a new country. Despite my worries, I could not have asked for a better time volunteering here on the Osa Peninsula. After spending one night in Puerto Jimenez, I took the Colectivo, the local bus, to the Piro Research Station. I enjoyed the scenery as we transitioned from farmland and ranches to the beautiful primary and secondary rainforest. After exchanging greetings at the station, I was shown to the cabin that would be my home for the next three months. After about ten minutes to settle in, I got right to work, and I went with Manuel Sanchez, the OC Sea Turtle Program, Coordinator, down to the turtle hatchery to perform a temperature check on the turtle nests. While I was there, I got to release my first Olive Ridley hatchlings into the ocean. It was such a special experience, and I realized that that it was something that not many people get to see in their life. Beginning at 4:00 am on my second day, I joined in on my first turtle patrol of Piro Beach. 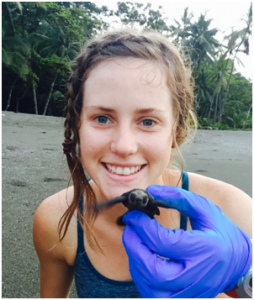 I was trained to identify turtle tracks and nests, find and remove eggs, and relocate the vulnerable nests to our hatchery. Later my second day, I hiked to the hatchery to perform another temperature check. During this hike, I took my time and looked for animals, took pictures, and just sat and watched the waves. I remember thinking to myself, “wow, I can’t believe this is where I work”. The early mornings were difficult at first, but now I truly enjoy going to sleep when the sun goes down and waking up with the sunrise. I am getting good sleep, exercise, and especially good food. I am already noticing that I feel happier and healthier than ever. One of the best parts of my first week was my trip to Matapalo, a nearby surfing beach, with another Research Field Assistant, Tabea. We saw so much wildlife there along the way. We saw coatis, tyras, and spider, squirrel, and howler monkeys all within the hour. When we made it to Matapalo we set our stuff down and both ran straight to the water. It was the first time either of us had gone swimming in the ocean since we had arrived. The water was a beautiful aqua blue and the perfect temperature. We did not get out until it was time to leave. We had to walk the entire way back, but that did not matter, as I felt completely refreshed, mind and body, by the ocean. 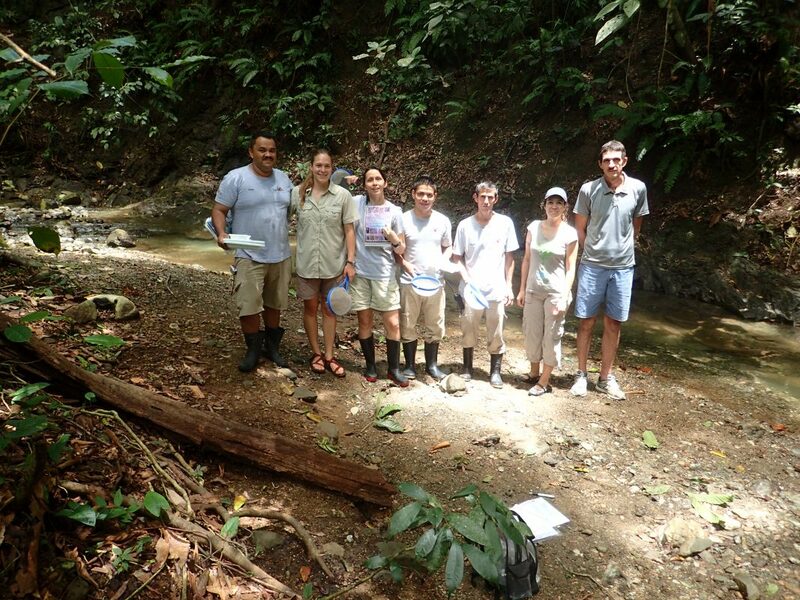 Recently,three more research field assistants have joined the team. It has been great working with other like-minded people who care deeply about conservation. We usually spend our nights talking, playing card games, watching movies, or playing music. I have been having so much fun every day that I am here. Nothing beats the feeling of releasing turtle hatchlings into the ocean and knowing that you help first hand in the conservation of these endangered species. My co-workers are wonderful and the scenery is incredible. With endless opportunities for adventure, I cannot wait to see what happens next. 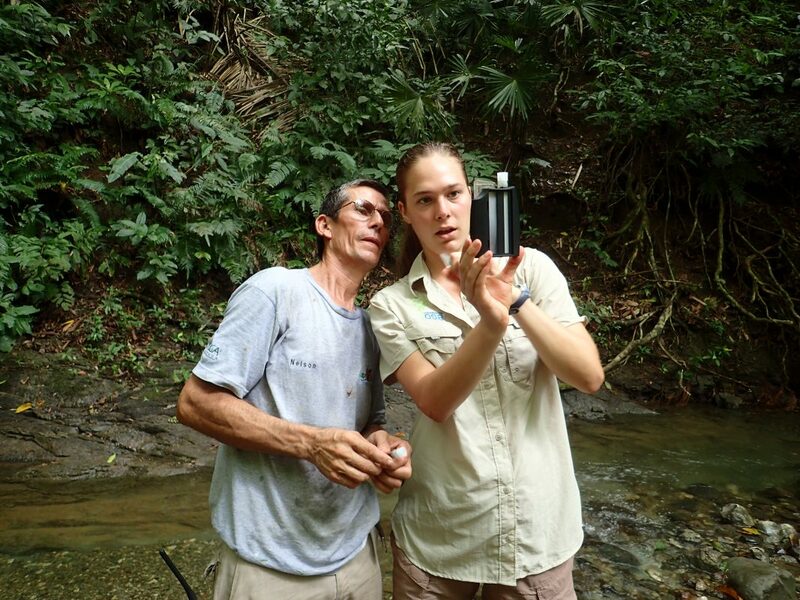 Cesar Barrio-Amoros holds a PhD in biology and is a notable taxonomist, herpetologist, author, and photographer. Following his experience in the Osa, reflected below, Cesar has planned to lead a reptile and amphibian workshop at Piro Biological Station next May or June, the beginning of the wet season. I have traveled throughout most of Latin America in search of amazing herping spectacles. In the Galapagos, I saw marine iguanas (Amblyrhynchus cristatus) and Galapagos giant tortoises (Chelonoidis nigra). I witnessed an astonishing diversity of poison frogs in Peru and made some interesting scientific discoveries on the Tepuis of Venezuela. 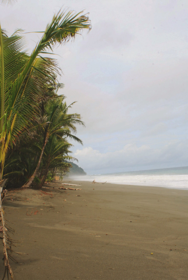 My curiosity has now led me to one of the tiniest countries: Costa Rica. Here, the herpetological diversity is bewildering and vibrant. Due to Costa Rica’s intense biodiversity, it is not difficult for a photographer to capture nearly all of the herping species in a matter of years. 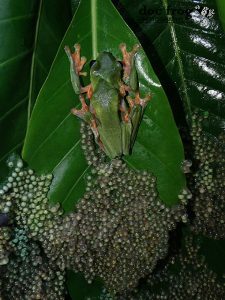 The gliding treefrog (Agalychnis spurrelli) was on the top of my herping list after learning about it on a BBC documentary. I have actually seen the individual species in the Caribbean and Pacific lowlands. However, I never saw one of those impressive reproductive aggregations where thousands of frogs gather in a pond and lay millions of eggs in just a few nights. I was envious of the photographs my colleague, Manuel Sanchez, captured while working at Osa Conservation’s Piro Biological Station in the Osa Peninsula. I immediately scheduled a visit to see the event. 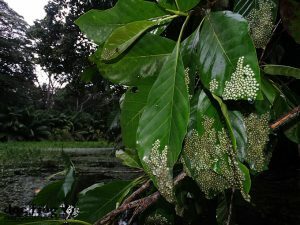 When I arrived, Manuel informed me that the area was full of frogs, thousands were laying eggs in amplexus (amplectant pairs). Around 6:00AM the next morning, we left for our journey along with herpetologist intern and researcher, Michelle Thompson. At the site, we noticed some bushes moving and, upon further investigation, realized there were a few frogs still laying eggs. The great wave was the previous night so only about 10% frogs remained. Still, it was a breathtaking sight because they were completely surrounded by millions of eggs! Michelle and I were amazed — this was quite an experience for a herpetologist. Next time, I need to arrive a few days in advance in order to catch the whole spectacle! Pilar (far right) explains and demonstrates the dissolved oxygen test. 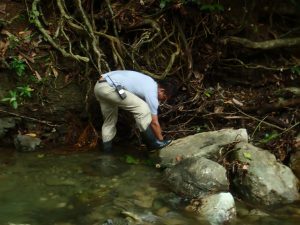 Last week, the Osa Conservation Rios Saludables team joined four staff members from the Lapa Rios Ecolodge for their second monthly chemical and biological assessment of Rio Carbonero’s stream health. Pilar Bernal (Education Outreach Coordinator) led the chemical portion of the monitoring, walking us through testing water temperature, pH, dissolved oxygen, turbidity, conductivity, alkalinity, and nitrates. Julieta Chan, the Lapa Rios Ecolodge Experience Manager, took detailed notes and filmed most of the workshop. Jim Palmer, Science Education Director and photographer, also did not let any of these details escape. 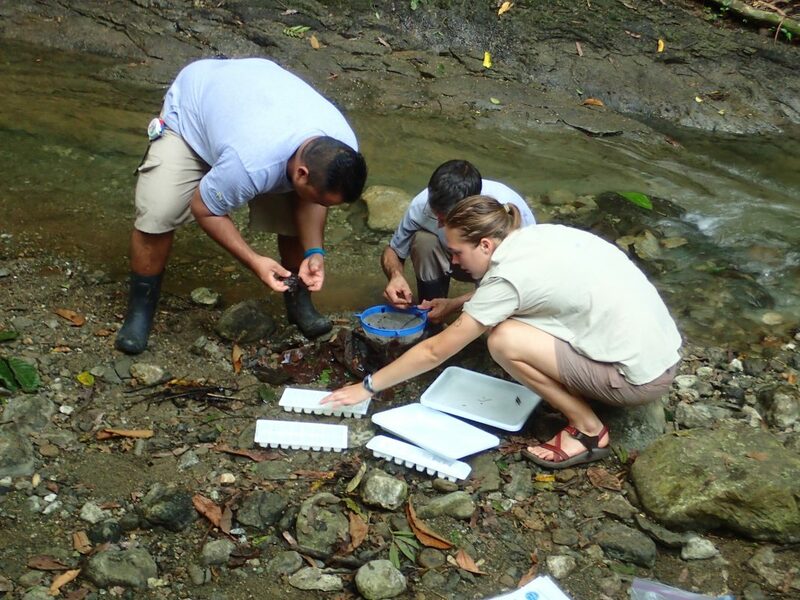 We love seeing their dedication to accurate aquatic testing! Accuracy in experimental nuances, such as adding reagent drops into a water sample or waiting for an alkalinity test strip reading, can directly affect the end results. Avoiding even the smallest mistakes ensures that our citizen-scientists are collecting trustworthy data to fill a baseline water quality database of streams in the Osa Peninsula. Nelson and Tabea read the pH measurement in order to determine the acidity of the stream. Tabea Zimmermann (Research Field Assistant) led the crew through the biological assessment portion of stream monitoring. She explained how macro-invertebrates serve as bioindicators of stream health. 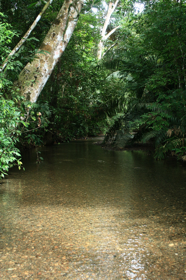 Certain species are more sensitive to pollution than others, so a strong presence of sensitive species in a stream indicates clean water and an adequate macro-invertebrate habitat. Armed with scoop nets and forceps, each participant explored riffles, pools, and leaf packs in the bubbling stream in search of mayflies, caddisflies, stoneflies, dragonfly larvae, beetles, snails, and shrimp. After some time, a staff member exclaimed that he discovered a hellgrammite! Hellgrammites, commonly nicknamed “perros del agua” in Costa Rica, are top predators in stream ecosystems. Due to their avid hunting skills and carnivorous diet, their presence indicates that a stream contains sufficient prey for them to survive – in other words, there is a thriving food web that is able to sustain its top species! Everyone huddled around the container to witness the food web live at work: the hellgrammite was enjoying some easy snacking among the tiny shrimp and larvae we had collected. Good news for Rio Carbonera! 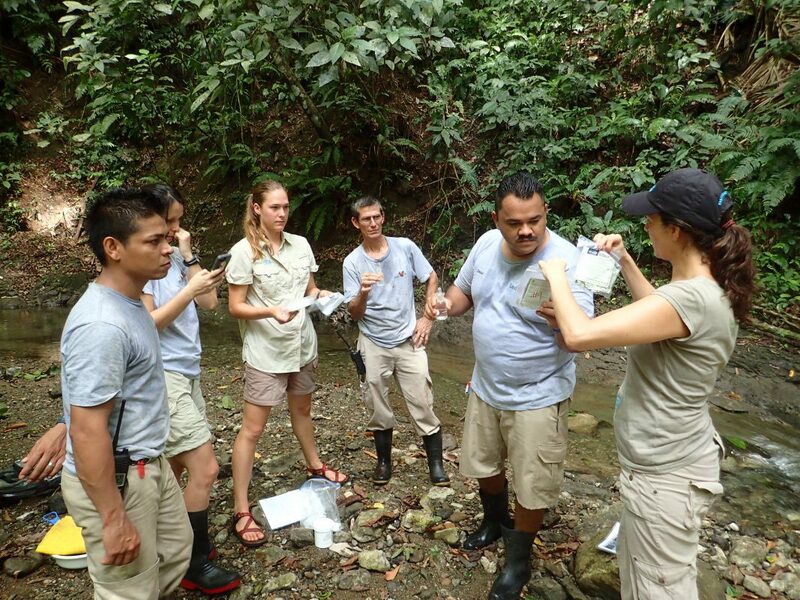 The team looks for macro-invertebrates and stores them into ice cube trays for identification. Julieta and her staff appreciated the second training and we are all excited to continue strengthening the Rios Saludables – Lapa Rios Ecolodge partnership. 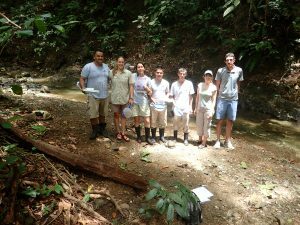 Moving forward, we hope to forge a future collaboration with the Rio Carbonera primary school so that Lapa Rios staff and local students can learn about and monitor the stream together in their shared backyard. Possibilities abound and the Rios Saludables crew look forward to engaging our local community towards appreciating and protecting the Osa’s vital aquatic resources and ecosystems. This group is ready to lead other Lapa Rios staff members through visual, chemical, and biological monitoring protocols. Let’s spread the skills and excitement for protecting a local stream!